I got word a little while ago that this morning a good friend passed away. I met Wes about ten years ago as I found my way in to the Arizona scooter scene. We didn't hang out much outside of scooter events, but when I did get to see him, it was always a great time. Wes was the kind of guy who, even if he wasn't your best friend, was certainly one of your greatest. He was always there to help you out and make you laugh. Always. He always had gifts for you (or for your dog, if you're Simon). He always checked in on you, to make sure you were having a good time. A lot of us didn't even deserve Wes, but we got him anyway... I, for one, am thankful to have known him. Goodbye, Wes. Rest in peace. i'm sorry to hear that, but glad you've got a headful of good memories. I'm sorry. He was too young to go. Oddly he -looks- like he'd be a cool chap. Maybe that's just 'cause he looks like a friend of mine, who is also a great guy like that. Sad, I guess some people are just too good for this planet. I'm so sorry to hear that! I was so sure after Ryan P pulled through, that Wes would as well. I have so many fond memories, including skanking away to Dave's Big Deluxe at the congress. I was sure he would outlast the decrepid old gay bartender there. It is so true about the gift thing. I remember once showing up early at the congress and wes was there with a gift for not only saey and I but he rememberred cory and had something for him as well. Not some lame thing that he puled out of his pocket, but a thoughtful gift that he had saved for months ij case cory came with us again. We are all missing something now that wes is gone. He had gotten engaged/married last I talked to him? Heh... Simon and I were talking last night about how Wes was a bouncer at the Fine Line in Tucson years and years ago and he used to check Simon's fake ID. There's a Yahoo group for the Arizona scooterists, and Ryan posted the news there yesterday afternoon. He said that details about a service will be posted shortly. I want to go, but I don't know that I'll be able to. It depends on when it is. 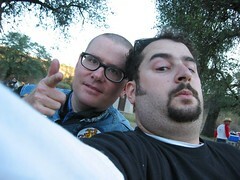 Simon and I were discussing doing an informal memorial of some sort at Tucson-Nogales this year. Yep, Wes married Katie I guess around two and a half years ago or so. We still have, and use almost every day, the silver bowling pin ashtray that Wes gave us years and years ago. I sure will miss him! It is really a shame that one of my crew has already head off for the Big Rally in the Sky. I'm going to track down a 40 and have a memorial a tiny one Pharaoh memorial for him in Amsterdam. He really was a quality fellow and will be fondly remembered while sadly missed. Any details on any formal services for him? No details yet. I'll let you know when I hear.